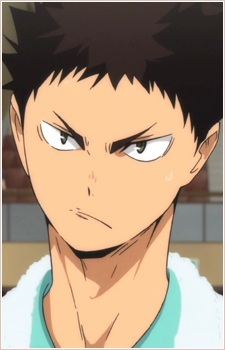 Hajime Iwaizumi is a 3rd year student from Aobajōsai High; he is the team ace and wing spiker. He is also Tooru Oikawa's childhood best friend and "pillar". Iwaizumi is a stubborn but reliable teammate, often filling in Oikawa's spot as a morale booster if needed. He acts supportively to all, including Tobio Kageyama, and calls Oikawa out for his childish antics. He often resorts to violence with Oikawa, but this does not change the fact that he cares immensely for him, as shown when he makes an effort to stop Oikawa from either working too hard or losing confidence. Iwaizumi's firm-yet-caring attitude has lead to some members of the Aoba Jousai team to look up and respect him, even more than their captain.